YTD TMT performance has been driven by the old guard – names like IBM, ORCL, HPQ, INTC, CMCSA, CBS, T and VZ are all up double digits. Meanwhile, FANGs and their ilk (FB excepted) have largely underperformed. What lies ahead for 1Q16 earnings season? Key things to watch for: 1. The unusually contentious political arena is driving campaign spending and big ratings – cable news (FOXA, TWX) and mobile (FB, GOOGL, TWTR) will be the biggest beneficiaries. 2. Incremental data points on smartphone and PC demand have been discouraging – OEMs (AAPL, Samsung, HPQ) and suppliers (QCOM, AVGO, SWKS, GLW) could be at risk. 3. Weak Q1 retail numbers do not seem to apply to AMZN, but sales expectations are high and margins are anyone’s guess. 4. The shift to the cloud continues – good for AMZN, MSFT, GOOGL, CRM, WDAY and others. The good times for old guard tech may be coming to an end. 5. TMUS will add customers, VZ and T will lose them, pay TV will lose customers too. 6. FX could help vs. expectations for a change – this benefits most, save for telecom/media, with components suppliers (QCOM, INTC, GLW, etc.) particularly happy. Will ’16 be more like ’14 or ’15? 2015 was the year of the FANGs. 2014 was dominated by AAPL, but also saw a major rally by traditional tech names. So far, 2016 has shaped up to be a 2014 rerun with a flight to “value”, but we think the resemblance will be short lived. 1Q16 earnings could deliver a jolt of reality into the retro rally. US ad spending will be strong. We believe presidential campaigns and their supporting PACs added $300M to the 1Q16 ad market directly, with ~80% going to TV. The raucous political environment has also driven a huge upside in news viewership, with Fox News leading ALL cable channels in primetime and CNN ratings up triple digits. This should yield upside for FOXA and TWX. While the campaign activities disproportionately favor TV, digital ad platforms – in particular, FB, GOOGL and TWTR – will also benefit, with core advertisers continuing to shift toward mobile. Device demand is poor. Gartner lowered its 2016 PC forecasts after reporting a larger than expected decline in Q1. Nikkei reports that AAPL has cut orders for iPhone manufacturing for 2Q in the wake of poor demand for high end smartphones. Our work (http://www.ssrllc.com/publication/smartphones-mobile-maturity/) shows 2015 high end devices nearing saturation and replacement rates at historic highs. Asian suppliers, such as TSM, report weakness in device component orders. We expect companies with exposure to smartphones and PCs to suffer for it in their 1Q16 results. AAPL, Samsung, HPQ, AVGO, SWKS, GLW, QCOM, and others may be at risk. AMZN facing aggressive expectations in a tough retail environment. US retail sales figures have been disappointing YTD, throwing shade on traditional retailers. AMZN seems to have done a bit better – US same store sales through its 3rd party marketplace were up roughly 16.5% in 1Q16, slightly slowing from the 18% growth in 4Q15. Of course fast growing and profitable AWS will be a real boon, as will FX on the expanding international presence, but with consensus asking for a QoQ acceleration from 21.9% to 23.1% sales growth, and with margins anyone’s guess, there is some risk around AMZN’s quarter. The cloud keeps coming. After blockbuster results in 4Q15, expect AMZN’s AWS and MSFT’s Azure to remain strong – we see 65% YoY growth for AWS and 100%+ for Azure. SaaS application players took a tumble after their 4Q15 results and guidance, but with a round of revisions behind us, 1Q16 should be back on track for stocks like DATA, NOW, and others, while players like CRM and WDAY, which delivered strong numbers amidst the sector tumult, should show sustained momentum. We see no reason, other than FX, for the traditional IT players to diverge from their downward sales trajectory, and 4Q15 “beats” by shrinking companies on the wrong side of the generational paradigm shift on cost cutting or overly pessimistic estimates should not be giving investors any confidence. Sub losses for everyone but TMUS. We believe that TMUS’ Binge On free video streaming initiative is resonating with consumers, yielding further share gains against VZ, T and S. T is expected to be the biggest loser – we believe the DirecTV triple play strategy is tired. VZ may have weathered 1Q16 with only modest attrition, but the wireline strike and heightened attention to the company’s sclerotic customer service will hurt going forward. S may have stanched most of its sub bleeding with promotions, but the brand has suffered badly. We see sub losses as well for pay TV – cord cutting may be amplified by improving streaming and the aforementioned Binge On, with the seasonally worst 2Q just ahead. The dollar is weakening. After an 18-month run, the US dollar has fallen back a bit in 1Q16 – a respite for export-heavy tech companies that have labored into the FX headwind. Component companies, like INTC, QCOM, TXN and GLW, make the large majority of their sales overseas, and could, as a result deliver 1Q16 upside as a result. Other companies with more than 50% exposure include PCLN (80%), AAPL (65%), MSFT (54%), GOOGL (54%) and FB (53%). 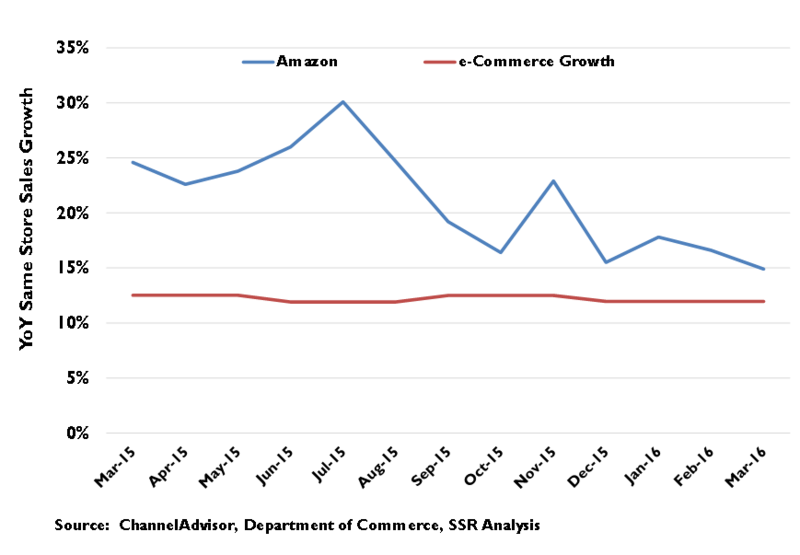 In contrast, telecom carriers (VZ, T, TMUS, and S), pay TV MSOs (CMCSA, CHTR, DISH, etc. ), and US media companies (DIS, CBS, FOXA, TWX, etc.) have very low FX exposure, and will not be effected. Our picks for earning season. While we have serious existential concerns for linear TV in the long run, the politically fueled ad market makes it tempting to buy FOXA or TWX for a trade – we would want to be well clear before the hangover hits at year end. For longer term investors, mobile ad leaders FB, GOOGL and TWTR are better bets. We continue to support enterprise cloud leaders – MSFT, WDAY, ADBE, NOW and DATA are all in our model portfolio, and, we believe, particularly attractive in the wake of the February sector bloodletting. An upside surprise from TMUS on Binge On driven sub growth also seems a likely possibility. While we are modestly concerned for AMZN’s 1Q16 results, we are confident in its strength through the end of the year and beyond. 2016 started off tough for TMT investors, with China worries fueling a January swoon and a February SaaS panic. March behaved considerably better, and the tech index actually ended 1Q16 up a tad over the overall market. Leading the charge has been a set of stocks that were unloved in 2015 – those creaky old ‘90’s tech leaders, TV-driven media, and dividend rich telecom/cable infrastructure names – but that had had a retro renaissance the year before that. While some investors may be hoping for a full season of 2014 reruns, we suspect that it will be a limited engagement. 1Q16 may tell us a lot. We believe that the raucous Presidential primary campaigns have dropped a gift of big cable news ratings and a big chunk of direct ad spending into the laps of media companies. We see FOXA and TWX as the biggest beneficiaries, with CBS enjoying the strong scatter market as well. Mobile ad platforms (GOOGL, FB and, to a lesser extent, TWTR) are also enjoying the robust US ad spending environment, while slowly eroding the position of traditional media with advertisers. Smartphone and PC sales are shaping up to be poor. AAPL and its suppliers likely have more downside once earnings confirm that iPhone replacement and Apple Watch demand are not meeting expectations. Other premium smartphone vendors are not likely doing any better, with all the demand growth, and then some, coming from low end models made for and by the emerging market. Gartner reports 1Q PC sales below even its previously reduced forecast – INTC and HPQ haven’t really suffered for it yet. AMZN may be a victim of heightened expectations – in a tough US retail environment, consensus projects sales growth accelerating from 22% in 4Q15 to 23% this quarter, with strong margins. We are true believers for the long run, but see some risk in these numbers. If AMZN beats consensus, it will likely be because of its AWS business – we see better than 60% growth and continued excellent margins as likely. MSFT will also be riding its cloud business. Its Azure IaaS platform is #2 to AWS and expected to have doubled sales YoY, while Office 365, Dynamics ERP, and other enterprise platform products also grow strongly to offset the decline of new PCs. Other SaaS players, like CRM, WDAY, ADBE, DATA, and NOW, are also expected to deliver strong sales. Traditional IT suppliers will continue on their slow but irreversible decline. 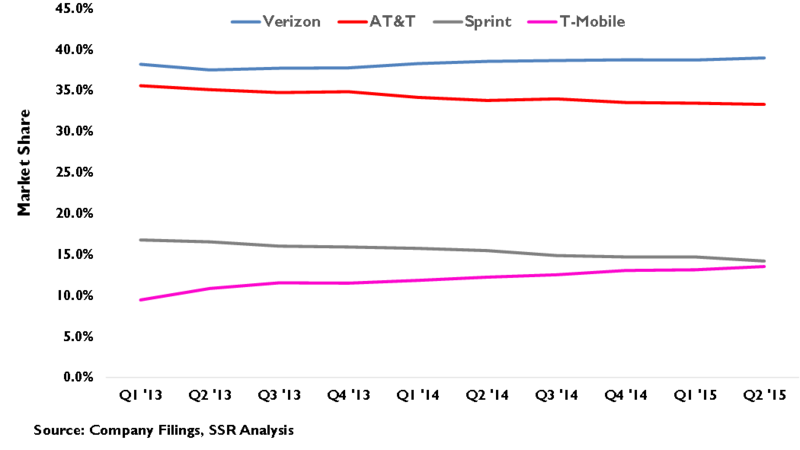 We see the competitive shake up in telecom continuing, with TMUS and its very popular Binge On program taking more market share from VZ and T, who seem content to protect ARPU as best they can. We don’t think S has really turned the corner. We expect Pay TV to join the wireless duopoly in shedding subs during the seasonally weak half of the year. The cord cutting narrative will get much louder. News heavy linear TV stocks are probably worth a trade heading into the quarter – although the ad market turns back into a pumpkin after election day. Digital media is a good bet in both the short and long term – GOOGL, FB, and, for risk takers, TWTR. 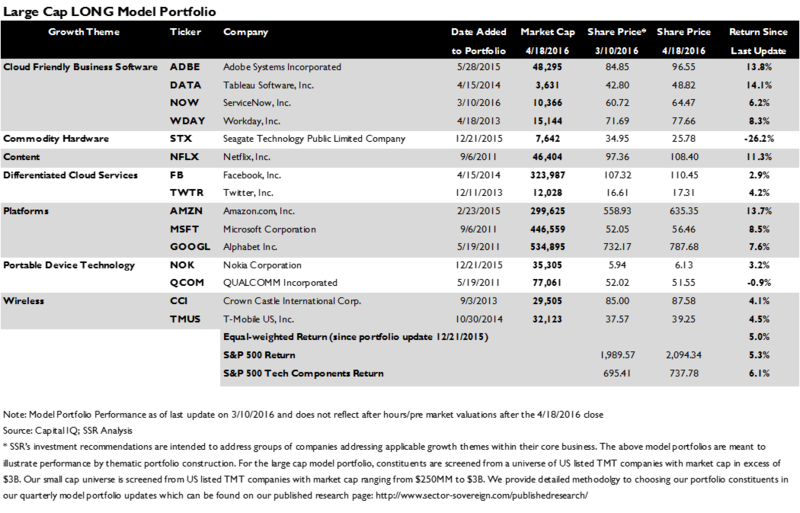 Look for SaaS names to rally after a tough 1Q – we have MSFT, ADBE, WDAY, DATA and NOW in our model portfolio. We also like TMUS to deliver a bit of upside to both sales and earnings. On the downside, we expect traditional IT companies to remind investors why they were laggards in 2015. Year to date, the TMT components of the S&P 500 have largely matched the performance of the broader index, staging a furious March comeback after the big January/February tech sell off. Leading this performance have been the unlikely coalition of old line tech firms (e.g. IBM, HPQ, INTC, CSCO, ORCL, etc. ), linear TV media (e.g. 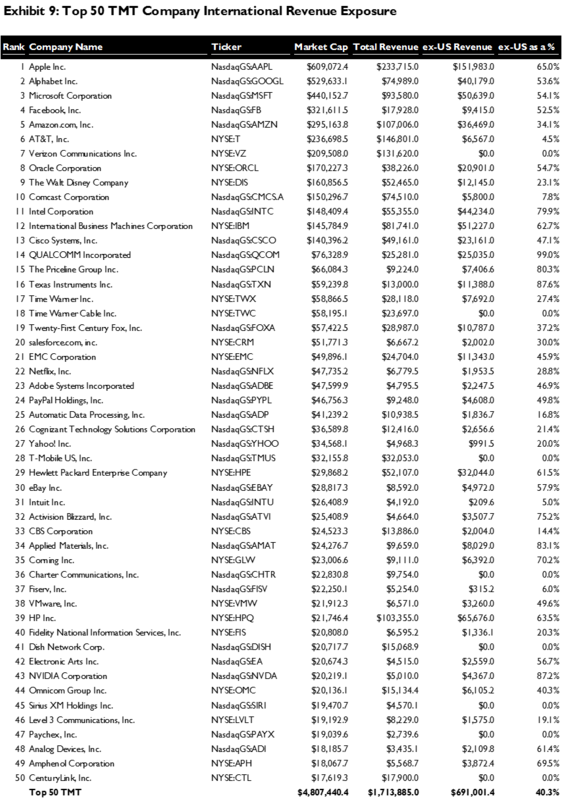 CBS, TWX, FOXA, and VIAB), and network operators (e.g. VZ, T, CMCSA, TWC, and CHTR). Add in a big comeback by “world’s most valuable company” Apple, which saw a variety of sell side analysts waving the all clear flag. 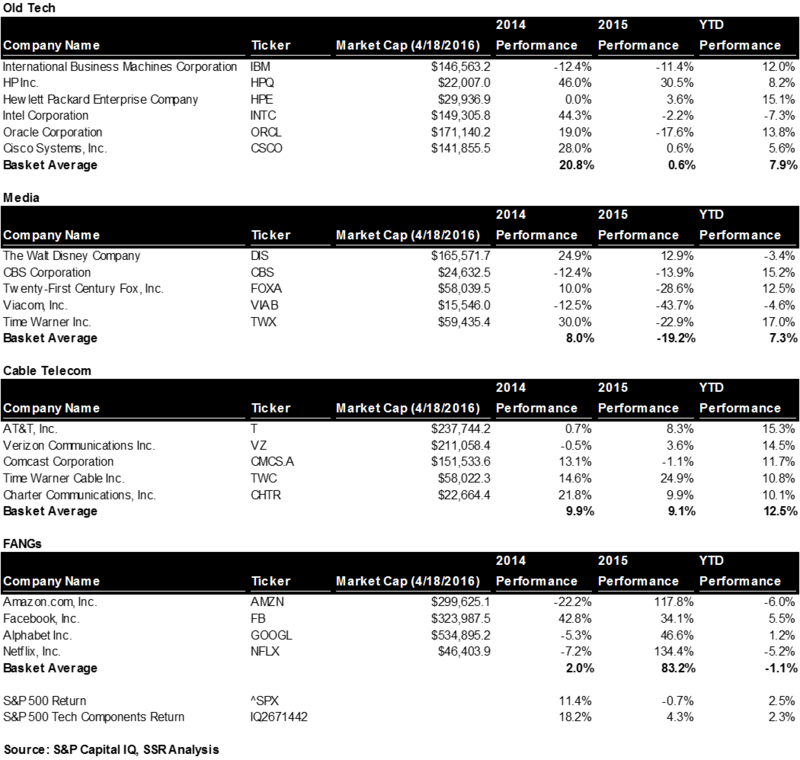 All of the companies listed have beaten the index YTD, with most topping it by double digit percentages. Meanwhile, yesterday’s heroes, the FANGs (e.g. Facebook, Amazon, Netflix and Google) have struggled, with only Facebook able to top the S&P 500 and both Amazon and Netflix off double digits YTD (Exhibit 1). So far, 2016 feels a lot like 2014, when Apple added 40% to its market cap on the furious demand for the iPhone 6, when ‘90’s tech leaders appreciated an average of 25%, when linear TV was still presumed to have a future, and when big dividend network monopolies were appreciated for their near-guaranteed returns. In contrast, the narrative on the FANGs was negative. Facebook finally figured it out, but Google was presumed to be the big loser in mobile, Amazon investors began to demand profits, and Netflix was dinged for its risky investments in original programming. However, we note that 2015 flipped all of those narratives on their ear. The FANGs collectively appreciated more than 80%. Old tech was saved by HP’s split into two, which drove 30% upside and brought the group to flat performance. The media basket was hit by an average of 19% and would have been much worse without a 4Q rally in the group. The telcos and cable operators were fairly flat for the year, a testament, perhaps, to the power of those dividends. Mighty Apple ended the year down a tick, on fears that the iPhone 6S wasn’t living up to its older sibling. We think 2015 may happen early this year. Old tech is not cheap and is on a depressing revenue trajectory. The big network operators keep losing customers, a trend that we believe will accelerate in 2016. Linear TV media is enjoying a windfall from Donald Trump, Bernie Sanders, and the rest of the slow train wreck of a Presidential campaign, but will face a nasty hangover when forced to compete for advertising dollars solely on the basis of their declining ratings and deteriorating audience quality. Apple is facing the maturity of their core premium smartphone market amidst slowing replacement and an uninspiring fall upgrade product. Meanwhile, the FANGs continue to concentrate market share and value, outgrowing everything else on the TMT landscape. According to Ad Age, Republican and Democratic candidates for their party’s Presidential nomination, and Political Action Committees supporting those candidates, have spent more than $400M on advertising thus far in the campaign (Exhibit 2). Most of that has spent in 1Q16, with TV picking up an estimated 80% of the budget. With the unusual competitiveness of this year’s races and the heightened contentiousness of the debate, 2015 estimates that the full election season would see nearly $6B in ad spending, a 15-20% increase over 2012, appear to be conservative. Meanwhile, cable news ratings have been through the roof. Fox News has been the number one cable network of any genre YTD and CNN reports primetime audience levels double those of a year ago (Exhibit 3). This translates to higher ad rates for ordinary advertisers looking to reach these energized viewers. We expect linear TV network companies to report strong ad sales for 1Q16, and while we are very skeptical that ad growth can be sustained without billions of dollars in campaign and Olympic spending for 2017 and beyond, there are still two more quarters before we will have to consider the hangover. The strong US ad market will also benefit digital ad platforms, and in particular, mobile ads. As we wrote in our recent Facebook piece (http://www.ssrllc.com/publication/fb-all-you-need-is-like/) the growth of digital ads is on trajectory to significantly erode TV and other traditional media. We believe that mobile will take all of this growth, and that the nature of the mobile experience – apps and tight platform control – will favor further concentration in a market already dominated by Google and Facebook. Twitter, which continues to effectively monetize its platform despite its stagnant population of registered monthly users, should also benefit. Last year, we wrote in detail about our expectations for a significant slowdown in premium smartphone demand and the reasons for it (http://www.ssrllc.com/publication/smartphones-mobile-maturity/). Essentially, penetration of premium smartphones into the world population likely to pay for them is high and the propensity of existing smartphone users to replace them is already at an historic high. It is not surprising then, to see reports of weak iPhone manufacturing orders and of slowing replacement demand. We expect this to translate directly into soft 2QFY16 sales for Apple and its suppliers, and to cautious guidance for 3QFY16 as well. Moreover, we are unimpressed with the projected specs and new features/functions planned for the iPhone 7 and are skeptical that an incremental device, particularly if it no longer supports traditional headphones as is rumored, can change the weak pattern that has been established. Bloggers have already shifted their attention to an expected major upgrade in 2017, which could incorporate an all glass design with an OLED display. That is a long time to wait for innovation. 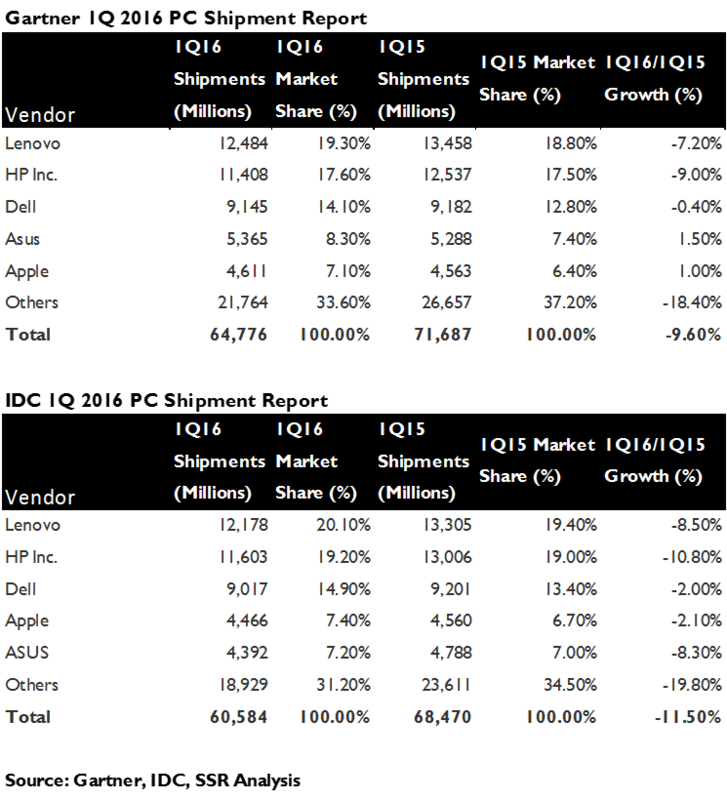 Similarly, Gartner has lowered its PC shipment estimates for 1Q16 once again (Exhibit 4). Slow PCs are an obvious problem for PC makers, like Hewlett Packard, and for component makers, like Intel, Seagate and Western Digital. These impacts have already begun to show in results for these companies and will likely weigh on their valuations until expectations fully incorporate a materially lower trajectory. Weak PCs may not be so bad for Microsoft – strong cloud sales from Azure, Office 365, Dynamics, and other businesses can more than make up for a shortfall in Windows licenses. Last quarter Azure grew 130% YoY, while the IaaS leader, Amazon’s AWS grew 69%. We expect more of the same, with Alphabet the only other player positioned to gain share. SaaS applications were a mixed bag in 4Q15 – Tableau, LinkedIn, and Service Now all missed or offered disappointing guidance, while SalesForce and Workday killed it. We believe 1Q16 sets up as a more consistent quarter with upside in most of the major names. We hold Microsoft, Adobe, Workday, Tableau and Service Now in our model portfolio. We are a little worried about Amazon, which, as per usual, has offered no real guidance for the quarter. In 4Q15, it accelerated nearly 22% YoY topline growth, astounding given a generally weak retail environment, yet the stock tanked as margins, and thus, EPS, failed to meet aggressive expectations. We believe that Amazon has substantial leeway in its margins, often choosing to reinvest profits and run the costs through the income statement rather than delivering earnings to shareholders. For much of its life, Amazon has had a special relationship with investors, which accepted this low margin, high investment arrangement. However, after delivering profits and generating over 100% appreciation in 2015, the decision to withhold those profits in 4Q15 was punished. This time, the market is expecting further sales acceleration to 23% YoY sales growth. This may be a difficult target, even for Amazon. ChannelAdvisor reports that same store sales by 3rd party sellers in Amazon’s market place were up 16.5% YoY in 1Q16. This remains excellent, and well above the 14-15% overall growth of ecommerce, but still a slowdown from the 18% growth observed in 4Q15. This is one data point, but it speaks to the difficulty of the consensus target (Exhibit 6). Furthermore, consensus also expects $0.58 per share in earnings in a seasonal quarter where Amazon has historically reported losses. Without any guidance from the company to suggest that it intends to deliver profits, the consensus seems aggressive. The wireless subscriber trends have been well established. T-Mobile has gained the most new subscribers by far over the couple of years, on the strength of its consumer-friendly “Uncarrier” initiatives, which remove pain points and reduce costs for subscribers. The latest of these, the “Binge On” program which allows unlimited video streaming by more than 40 different providers without counting against data usage limits. We believe that this program has been very popular, particularly with younger subscribers, some of whom have dropped landline broadband and gone entirely wireless (Exhibit 7). We believe that T-Mobile will deliver more than 1.5 million net new subs for the quarter. Meanwhile, Verizon will join AT&T in reporting declining phone subs, preferring to protect high prices and margins rather than compete to hold on to market share. We do not believe that either company has an adequate strategy to counter the growing exodus of customer. AT&T’s “triple play” with satellite video is about 15 years too late, while Verizon’s move into video content starts nearly from scratch. AT&T and Verizon will also likely suffer declining video subs, which may be bad enough to hide the overall decline in Pay TV from Comcast investors. Comcast and Time Warner Cable crowed about rising PayTV subs in 4Q15, but overall industry subs were still down YoY in what is the industry’s best seasonal quarter. 1Q and 2Q16 will be much more difficult to show growing subs even with share gains from Verizon and AT&T. The US dollar finally stopped its gains against most of the world’s currencies, giving American exporters a much needed break (Exhibit 8). Most technology companies have significant foreign exposure, while Media and Telecom companies tend to have less or none. 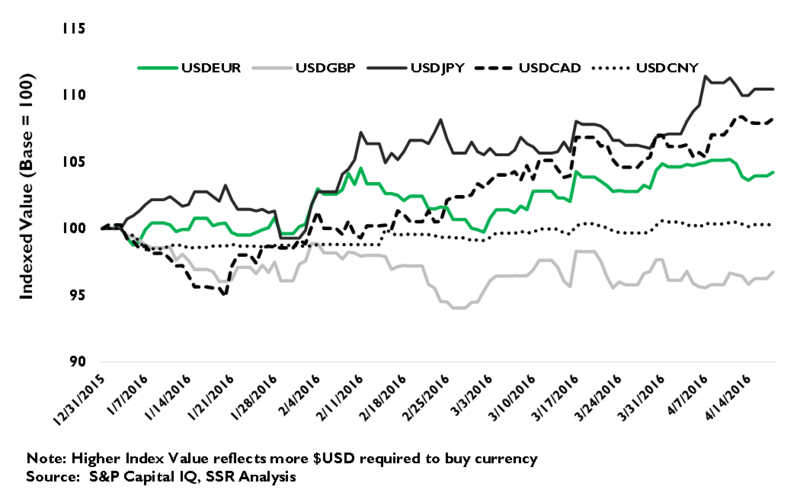 The long rise of the dollar has been particularly painful for components companies, like Qualcomm, Intel, Texas Instrument, and others, and while most have employed effective hedging strategies, 1Q16 could see modest upside vs. consensus on FX (Exhibit 9). Most of the other leading tech names – Apple, Alphabet, Facebook, Microsoft, IBM, Oracle, etc. – all see more than half of their sales from foreign markets. With a weaker dollar, reported revenues will be a bit higher and margins a little bit better. Traders may want to buy media stocks in a strong ad environment – FOXA and TWX have the best exposure to politics – but we note that the good times are likely to end on November 7. The compares in 2017 will be very difficult. We are more comfortable with the digital ad purveyors. Alphabet and Facebook control 54% of the US mobile ad market between the two of them – we think it will go higher. We also see much maligned Twitter as a mobile ad share gainer and see glimmers of hope on the user growth front. We continue to like the cloud software space, focusing on Microsoft and on strong SaaS application plays like Workday, Adobe, Service Now and Tableau, which we believe are poised for a significant rebound after 1Q16 troubles. We like T-Mobile for the reasons noted above. We are a little worried about Amazon, but would be buyers after they print their number. We are very worried about Apple and would stay away until there is reason to believe that the company can reaccelerate growth. We are concerned for traditional IT. Most of the companies are shrinking, and it is very difficult to cut your way to long term prosperity in tech.